Happy Friday everyone! 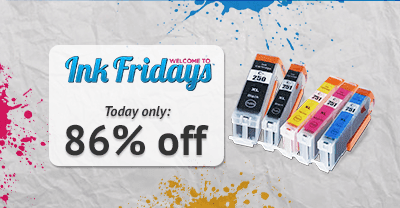 We’ve outdone ourselves this Ink Fridays™ with a deal you might find hard to believe. 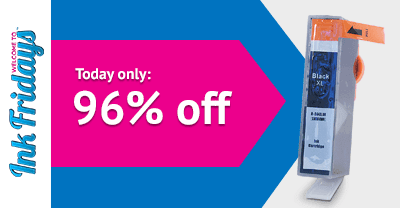 Our deal of the week should make you HP printer owners quite happy, here it is: 96% Off HP 564XL Black High Yield Ink Cartridge Replacements. So, what this means, is that you can buy these HP 564XL Black ink cartridges for less than a dollar at only 90 cents instead of $23.99 at retail price! We always enjoy giving out special offers to our amazing customers, and we're more than happy in sharing over 96% in savings with you this Friday. Remember though, this deal is only for February 27, 2015 and ends at 11:59 PM (PST). If you'd like to check out the offer, or hey, are ready to buy - click the link here. Is My HP Printer Compatible? Never Miss an Ink Fridays™ Deal! Ink Fridays™ deals change every week, and they can be anywhere from ink cartridges like today's or even photo paper. You are more than welcome to sign up for our newsletter where we'll send you an update on this week's offer - don't worry, we won't spam you. It's only once a week. You can sign up here at this link: Ink Friday's Newsletter. Don't forget you still have time to save on HP 564XL replacement cartridges for only 90 cents, too! Fridays just got a little sweeter with our latest Ink Fridays™ deal at CompAndSave.com, and we have a feeling you’re going to love this one. This week’s special offer is: 86% Off Canon PGI-250XL (Pack of 5) Compatible High Yield Ink Cartridges. Our special pricing of $8.95 means you can purchase each ink cartridge for only $1.79 instead of $66.99 at retail price. Want to stock up on Canon PGI-250XL ink cartridges but don't know if your Canon Pixma printer is compatible? We're here to help, please check below if your printer is listed. Our Ink Fridays™ deals change every week, from different printer cartridge brands to photo paper. So if you don't see your ink or toner cartridge, sign up for our mailing list to catch your special deal. You may also find our special offer on our Facebook page. Don't forget this week's deal ends at midnight. You still have time to save 86% off Canon PGI-250 compatible high yield ink cartridges - check out the deal now. So you thought printing was just about shoving a sheet into the printer, clicking print, and getting your printout all in a few seconds? Well, inkjet printers are usually that simple to use, but there is much more to printing than printout out letters, bills, photos, etc. 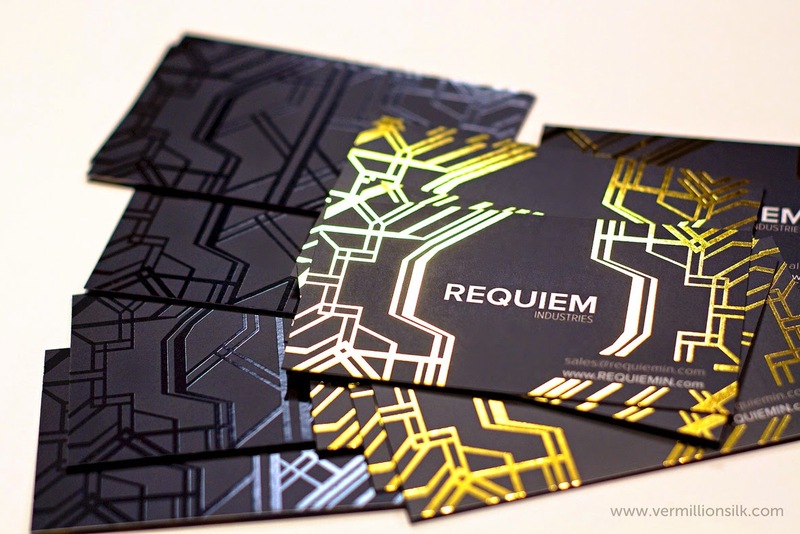 There are several different printing techniques that can give you impressive results, like these for example. One of the oldest printing techniques is the Wood Block technique where a reverse image is actually carved into wood and then stamped or pressed down on the printing sheet. 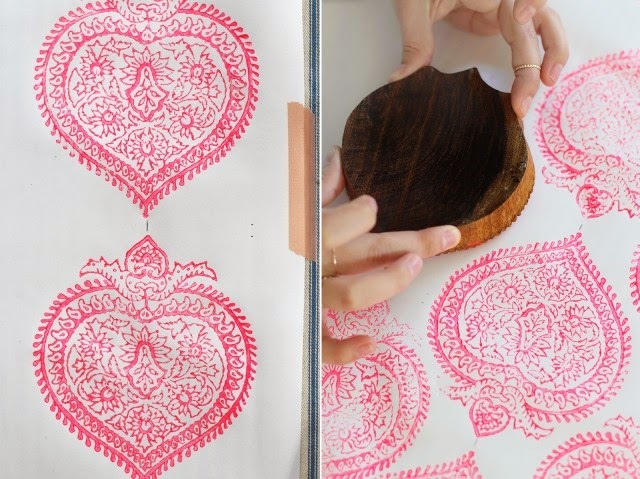 This method is still used for block printing fabrics by hand for traditional Indian textiles using vegetable dyes. Another printing technique involved individual letters made of wood or metal, used for typesetting by hand, which could help print books and large documents relatively quickly. Then there are methods of printing such as photo typesetting, which is now more or less obsolete and offset printing which is still widely used. This is a method of printing where the paper is literally engraved; where a depressed impression on the printing surface creates the image or letters. The image is transferred to Rotogravure cylinders with a steel base and a copper layer which is then used to print on paper to create the distinctive grooved letters. This printing technique is also known as debossing. 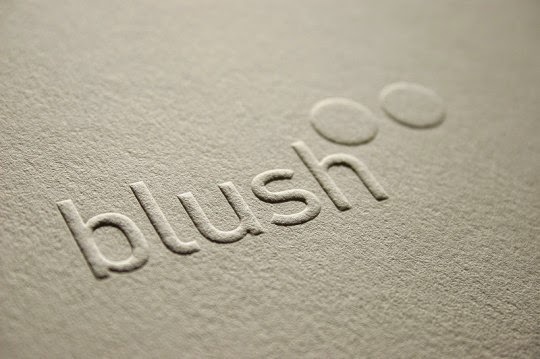 Basically the reverse of engraving, embossing creates a raised, 3D printed effect on the paper. The printing could be of a thicker style, raised in way that can be felt and not just seen; or it could be the printing surface itself that is raised so that it appears to have been engraved from the reverse side of the paper. Dry embossing or heat embossing are different techniques used to create specific results. This technique basically creates a protective layer over the print surface to prevent running, tearing and to create a sheen on the surface. This laminate finish makes the printed material water resistant and smooth to the touch. Not unlike lamination, a varnish finish is a liquid coating that is added to the printed surface to create a matte or glossy finish. Mostly used in commercial printing, this process uses gold, silver or other metallic foil is used to overlay the print surface. Machines called hot foil stampers are used to transfer the foil or other opaque films to solid surfaces. Books, pictures, napkins and pencils often use this kind of foil printing process. Rather similar to other printing techniques such as engraving, thermography is a more cost effective process. Here ink is laid down, thermography powder is used and then heat is applied to raise the image off the print surface slightly. Inkjet and laser printing are processes of printing that all of us are familiar with. These are also the most widely used printing solution for non professional printing requirements. The inkjet printing technique basically sprays the fluid ink on to the print surface to create documents, images, graphics and more. Laser printing uses dry ink and heat to create images or printed documents that are fused on to the surface of the paper or stock sheet. Depending upon the requirement of your print project, you can use the right printing technique for optimal results. What cool projects do you have lined up? We’d love to hear. Share with us in our comments section or even via our Facebook or Twitter pages. Following us via our official social networking pages or subscribing to our newsletter helps connect to us and also informs you about upcoming store events and discount sales. It’s not quite time to say TGIF, but we have another jaw-dropping Ink Fridays™ deal at CompAndSave.com. Our special offer this week is a: Buy 1, Get 2 Free – 4”x6” Premium Glossy Inkjet Photo Paper (20 sheets). Available exclusively on this Freaky Friday of February 13th, you can purchase 60 glossy photo papers for less than $0.60 per pack. With a retail price at $8.97 for 3 packs, that means we’re giving over 80% in savings! Stock on glossy photo paper to create elegant portraits and pictures before this deal ends at 11:59 PM (PST) on February 13, 2015. See our better than BOGO deal here. Don't Miss An Ink Fridays™ Deal! Ink Fridays™ always offers a new deal every week, from printer cartridges to photo paper. We usually share what we're offering here or on our Facebook page, but you can also stay in the loop with our newsletter. Want to sign up? You can join here and never miss out another surprise printer ink and photo paper discount. Remember, Buy 1, Get 2 Free 4"x6" Premium Glossy Inkjet Photo Paper (20 sheets) ends at 11:59 (PST) tonight. Don't miss out on this chance to save big, get your glossy photo paper here. "Pink doesn't yield, it survives!" Small steps lead to big changes. We love this saying. After all, it was not with one, but everyone's help, who participated in our fundraiser for the National Breast Cancer Foundation that allowed us to sign and a mail a check for $13,168 last October. By working together through donations and social media sharing, we were able to help their "pink warriors" pay for mammograms and support their education and hope programs. In honor of this great achievement, we made a "Pink Doesn't Yield, It Survives!" 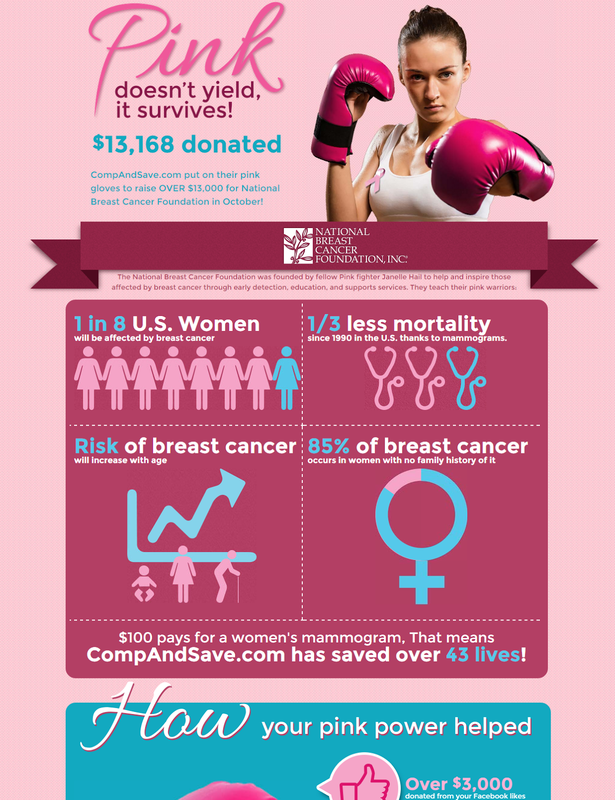 infographic to share with everyone who put on their pink gloves and helped make this National Breast Cancer Foundation fundraiser successful. Did you know that the risk of breast cancer increases with age? Or that 85% of breast cancer occurs in women with no family history of it? Numbers and facts like these usually aren't common knowledge. That's why the National Breast Cancer Foundation offers educational services to their pink warriors as well as mammogram help. So next time you think one small action won't make a big difference, remember this campaign. It was with your help that we were able to donate $13,168 to the National Breast Cancer Foundation last October. Whether it was by liking our Facebook page, retweeting on Twitter, re-pinning our Pinterest images, or purchasing ink or toner on our site - we thank you. Remember, October isn't the only time of the year to fight against breast cancer. Help spread awareness by sharing this post with friends, family, and other loved ones. It’s almost Friday, and once again we have another special Ink Fridays™ deal at CompAndSave.com. This week’s exclusive offer is: Kodak 10XL (4 pack) Compatible Ink Cartridges. For today only, you can order these 4 cartridges for only $6.95 (each is $1.75). That is 87% in savings in comparison to the retail price of $55.40! So if you have a Kodak printer, you may want to stock up and save before February 6th at 11:59 PM (PST). C'mon over and visit us here for this TGIF deal. Not sure if your Kodak printer is compatible with this compatible Kodak ink? No worries, just check below and see if your printer is listed. You can also enter your printer model at CompAndSave for a list of compatible ink cartridges or toner cartridges. Delivering quality, cost-effective ink to our amazing customers has always been one of our goals, and Ink Fridays™ reflects that. The deals change every week, so if you want to keep up with our Ink Fridays™ offers, just come back to our blog, Facebook page, or sign up to our newsletter to never miss out. 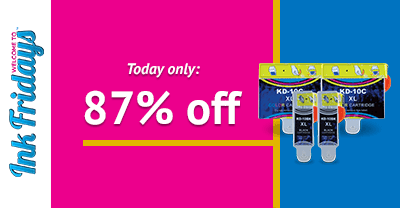 Remember, 87% off Kodak 10XL (Pack of 4) compatible ink cartridges ends at 11:59 (PST) tonight. Don't miss out on this chance to save big, get your Kodak ink here! learning more about heart attack risk factors, symptoms and treatments and by making changes to achieve better heart health. We at CompAndSave.com are not just a leading online store for high quality compatible ink, toner & printer accessories, but also a company that recognizes its Corporate Social Responsibility. As a part of this social responsibility and the need to give back, we joined in the fight against cardiovascular disease, the No.1 single biggest killer in the country. Last year as a part of our endeavor to support the fight against heart disease, we donated $1 from each ink purchase to the American Heart Association to support their efforts at disseminating information and improving treatment protocols. In 2014, we donated $9,290 on your behalf via the website and another $1,000 on your behalf through Facebook likes. The total contribution of $10,290 is equivalent to each one of these: 1) placement of more than 9,000 AED locators, 2) 514 families learning about good health habits, 3) or 21 doctors getting up to date on stroke treatment and prevention. According to the CDC, Cardiovascular disease (CVD)—including heart disease, stroke, and high blood pressure—is the number 1 killer of women and men in the United States. It is also the leading cause of disability among the people and results in a poorer quality of life that curtails one’s activities at personal and professional level. The cost to the exchequer is high too: heart and heart related illness cost the United States $300 billion each year when you count medical costs and add lost productivity. If you want to spread awareness about CVD this Heart Month, be a part of National Wear Red Day which is scheduled for February 6, 2015. This is the day to honor all the women who suffer from heart ailments. The idea is to try and save the lives of 1 in 3 women who die of stroke or heart attack each year. This is important because we tend to think of heart attacks as happening to men more than women; whereas heart attacks are the NO 1 killer of women in the country. Wear your support, and learn how to take swift action in case of a disease or a stroke. Eat healthy by including plenty of fresh fruit, veg, whole grains and lean protein in your diet and by cutting out processed, packaged food to the extent possible. So what do you plan to do this Heart Month? How to do plan to do your bit to spread awareness and what changes do you plan to make to the lifestyle of your family and yourself to achieve better heart health? We’d love to hear about some of your ideas below in the blog comment section or on our official Facebook page. If you’d like to know more about our future projects, be sure to subscribe to our newsletter. 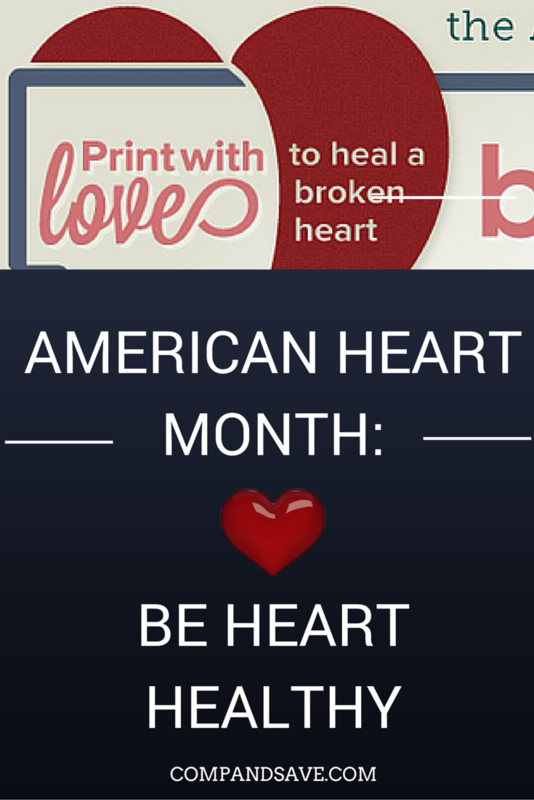 American Heart Month: Be Heart Healthy! Notice something different about our company logo? Over the weekend, the CompAndSave team updated our logo to reflect an important national occurrence in February. In case you were wondering, it's not Valentine's Day. In honor of American Heart Month, the CompAndSave team has changed our logo design to promote being heart healthy and raise awareness about heart disease to our readers. We recognize every heart is precious, and including it in our company logo represents joining the fight against cardiovascular disease (CVD). We wanted to once again do our part this February to fight cardiovascular disease (CVD). Last year, we actually fundraised and donated over $10,000 to the American Heart Association thanks to your help. This company logo design is just another small step toward making a difference. Let us you know what you think of our new logo design in the comments below! 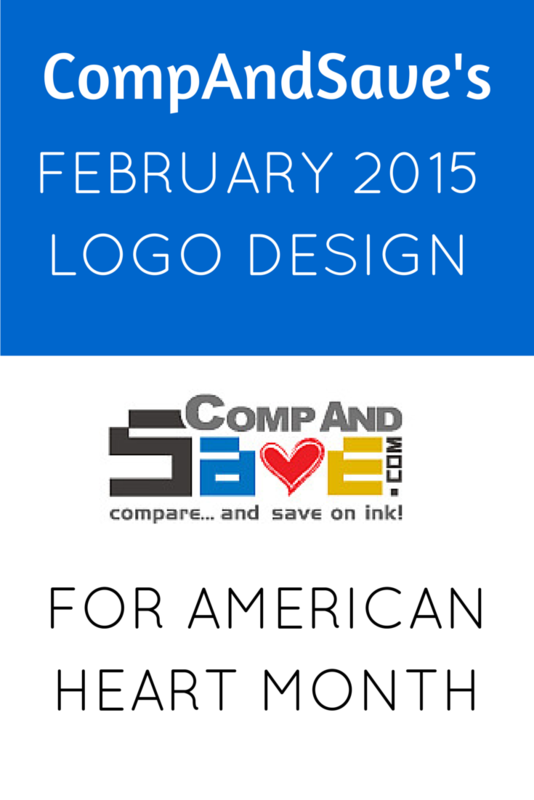 Why Did CompAndSave’s Logo Design Change – February 2015?